This month's Julep Maven box is among one of my favorites that I have received. For June, I decided to go with the boho glam box which contained two gorgeous nail colors that I already can't get enough of, a tinted lip conditioning treatment that soothes and hydrates my lips like nobody's business, and of course, a couple of treats to satisfy my sweet tooth. Isabela: I am on a serious blue nail polish kick right now, so of course I was happy to see this Amparo blue cremè hue in my box. The formula is really nice (two coats provide opaque and even coverage), and I love how the color pops on the nails. Manda: Another blue nail color! But this isn't just any light blue polish, it's taken up a notch thanks to the golden shimmers it contains. I don't have anything like Manda in my collection, and it makes for a really fun new addition. Formula-wise, it's a little thinner than Isabela, but totally workable. Two-three coats will do for opaque, even, and streak free results. Luxe Your Lips Tinted Conditioning Lip Treatment: This paraben-free lip treatment (I have the shade "poppy") couldn't have arrived at a better time. My lips have been on the dry side lately, so they were in dire need of moisture. This conditioning lip treatment contains ingredients like pumpkin seed oil to help retain elasticity, and vitamin e to prevent collagen loss. 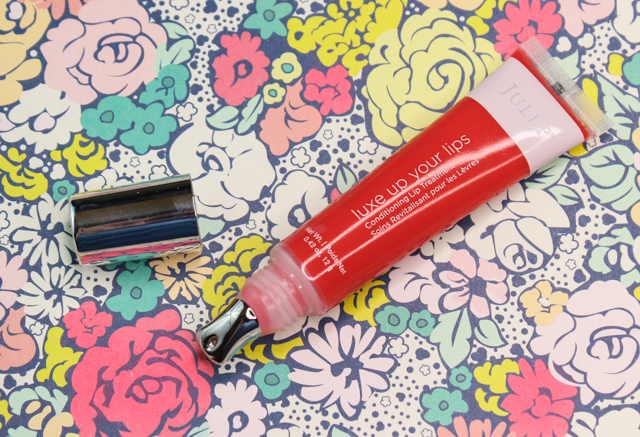 The cooling applicator tip-which I love, boosts circulation and soothes the lips. My lips not only feel moisturized after applying this conditioning lip treatment, they look healthier, and the sheer hint of color this imparts on my lips is a nice bonus. 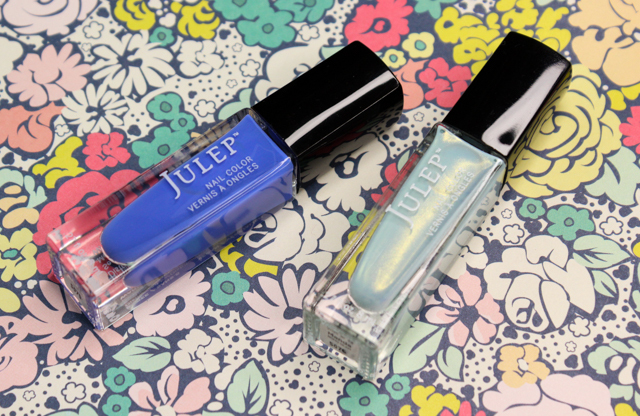 If you want to sign up for a monthly Julep Maven subscription of your own, you can do so here.